What a great time to be into film photography. Cameras that take film are rapidly declining in price, but still available in great condition. Film is still ready to buy in a reasonable range of flavours on ebay, and scanners like the Epson V700 relatively affordable. It’s not going to last, but it is a golden age for analogue! In the spirit of making the most of this window in the technology timeline, I recently picked up a Minox 35GT from Ebay’s dodgy brother in law, Gumtree. Minox traditionally made compact and “spy” cameras. The body is moulded plastic but extremely well made, as you would expect a german made item to be. The camera that arrived was a little bit sticky when moving the parts for the first time – it has probably been sitting in a drawer for at least 15 years. The camera switches on when the front is folded down into the open position. The light meter then starts working out the shutter speed based on the aperture automatically, with a shutter speed needle in the viewfinder. The lens has a fixed focal length of 35mm which is cool for street photography. The aperture works as a continuous twist on the lens from f2.8 to f16. The f2.8 is a real plus for such a compact camera. Pop some iso400 film in there, and you are pretty much covered for most occasions! The film speed is selected manually with a dial rather than using the DX coding bar. Compact film cameras have been gradually becoming of more interest to me over the last few months. A number of them, particularly some of the higher end cameras, only had auto DX code ISO. 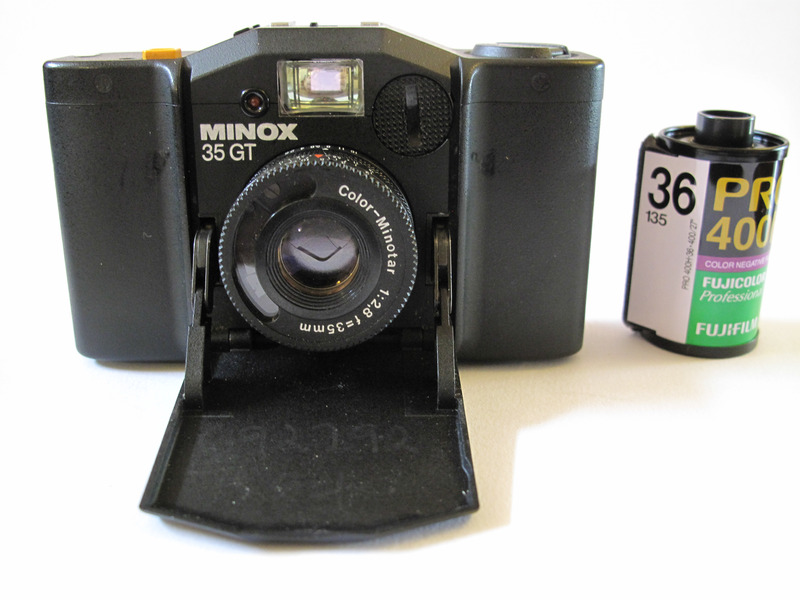 The Minox 35GT takes an old mercury based battery, the PX27. Hmmm, not a very easy thing to acquire. Channeling my inner MacGyver, I taped up four LR44 batteries with some electrical tape. Worked perfectly! I was actually fairly impressed with my handy skillz. So, enough preamble. How did the camera perform in the CBD this morning? The shutter speeds struggled occasionally from a range perspective – the fastest speed is 500, and with 400 film in, it can hit the ceiling pretty quickly. Nothing a quick dial down of aperture couldn’t fix, but a bit challenging. There is also a button to compensate for backlighting, which might help this, but it is all a bit too much of a hassle for me. The flip down panel keeps the lens nice and clean, and only takes a second to prep for a shot. The camera is quite tiny, and very inconspicuous. It literally fits in the palm of your hand. Combined with the almost forced use of hyperfocal distance focusing, the size is great for taking quick shots without even looking through the bright viewfinder. The size of the camera is completely inoffensive. It looks like less than a toy, and nobody really gave me a second look when I pointed it in their direction. Minox sure make stealthy cameras! The shutter is extremely quiet, almost silent. Winding on the film can be a bit hit and miss. The lever is very small, and hard to get your thumb under, and it takes two winds to get to the next frame. First world problem, but you are not going to be able to rapidly go for a second shot easily. I rapidly clicked through a roll of fuji pro400h. A couple of times I needed to quickly spin the aperture ring around to get the exposure right – the small size of the camera leads to inevitable compromises. Getting my mitts on the ring and controlling the aperture was very difficult whilst still looking through the viewfinder. Adjusting the focus ring is also advisable, so setting up the camera for both focus and aperture prior to the shot is the go. It was a great challenge for my spidey sense on exposure and focus to get this right. I will post the images from the first roll once they are developed and scanned. Images from other users on Flickr look pretty good! First thoughts on the Minox 35GT are very positive. It is an easy to use, unobtrusive street camera. If the rolls come back looking good, I might even have a look at getting a more minty edition from Ebay. The Minox fits in a pocket, is safe in there without a case, and has a great focal length and an f2.8 lens. I had one, but with fading eye sight and big hands, it was too hard to use.